CHOSA’s last featured woman to wrap up women’s month is Nomsa. She is the founder and principal of Blessings Educare, a creche (preschool) located in Delft. Her passion and drive for creating a safe space for children to learn and grow is what drove her to start Blessings. Nomsa says that the name for her educare was derived from what she views children to be: Blessings. While she views all children to be blessing to all who interact with them, she also wants more blessings for the children who attend her creche. She wants Blessings to give the children blessings to go further with their futures, blessings to study further, and blessings to lead a life full of happiness. Simply put, because of children are blessings, she knew she had to name her creche after what they meant to her. Blessings started out when Nomsa saw a gap in her community, as parents were going to work early in the morning and getting home late in the evening, and leaving siblings or grandparents to take care of the children while they were gone. 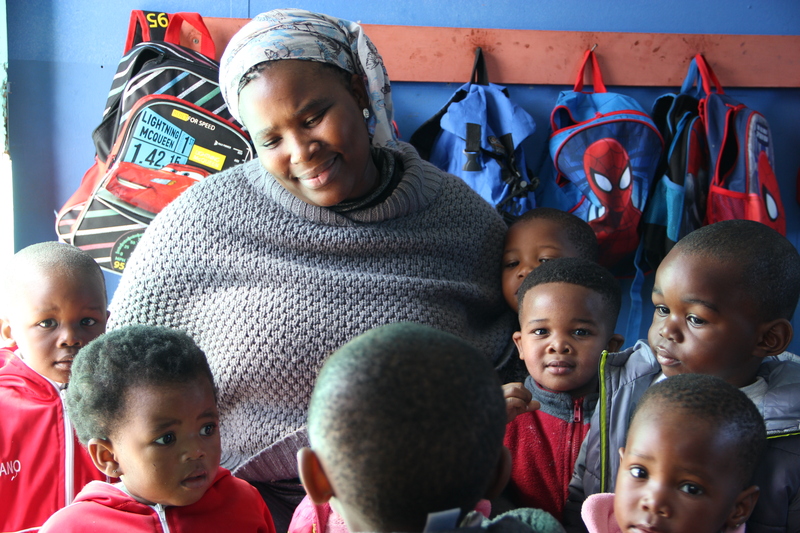 With limited oversight of these children, and no formal childcare within the community Nomsa decided to open the doors of her house in 2014 to take care of a few local children. As the word spread about Nomsa’s small childcare business more and more parents began arriving at her door and enrolling their children to be in the care of Nomsa. But, as more children became signed up, she quickly outgrew her small space and had to expand her business. She then rented space from her neighbor to meet the growing demand for her services, but this too became too small. In 2016 she moved Blessings to a plot of land across from her house, where she now has two container classrooms and a shed which houses the kitchen, office, and Grade R (Kindergarten) class. On an average week Nomsa now has around 90 children in her care at Blessings, ranging in age from one to six years of age. It’s amazing to think about how much growth has happened at Blessings in the past three years! Nomsa is motivated to help the children of South Africa, and is well on her way to making a huge impact in providing early childhood education to children in her community. She believes a strong foundation in early childhood development can set these children up for a better future for themselves and their families. As Blessings continues to grow and thrive, as Township Farmers, a once-off grant recipient of CHOSA’s has recently planted a beautiful and fruitful veggie garden on their property, the sky is the limit for Nomsa’s success and the future of Blessings. Nomsa, as principal continues to educate herself on early childhood development by attending weekly classes in curriculum development to bring back and train her teachers. Nomsa hopes to grow Blessings into a space that also provides after school care and support for children who are already in primary school, to offer a safe space where older children can receive homework support, and a loving place to stay until their parents get home form work. Being a community leader, Nomsa has been able to create new opportunities for children to thrive within her community. Through the support of CHOSA volunteers Nomsa has put in an application to purchase her land, which will open more opportunities for Blessings to expand and transition to having permanent structures. With Nomsa’s commitment to the children of Delft, and her continued efforts to improve her community through education, CHOSA has no doubt she will be successful. We are very proud to call Nomsa and Blessings a CHOSA partner organisation! Thank you for all that you do for the children of South Africa Nomsa!